This School Warmed My Heart… and brightened my outlook for the future. Today, we were able to visit with the students at Corpus Christi Catholic School in Mobile, Alabama. This school was obviously very high-performing. The student— even the kindergarten group– asked really smart, thought-out questions and were genuinely interested in our presentation and story. More importantly, I have a real concern for the direction of this country. Regardless of who wins the election this evening, there will still be gridlock in Washington. The only thing that will break this pattern is when we the voters become as non-partisan as what we demand in Washington. What do I mean by this? We need to start voting by issue and person— not party. The kids today were learning about America’s Election process and actually holding a mock election between President Obama and Governor Romney. They were downright excited to cast ballots and inquire of us whether or not or how we had voted. The whole thing was so cool to see… and it strengthened my hope that this future generation can perhaps break the partisan gridlock, if us current adults fail to do so. Have a good night… I’ll be glued to the television. Ok… as we found out yesterday, I’m a politics nerd. Later this afternoon and this evening, I’ll be in heaven. This morning, we are heading off to NBC 15 in Mobile, Alabama for an appearance on their morning news. Later in the day, we are visiting Corpus Christi Catholic School in Mobile. The students are excited… and so are we! Honestly, their staff has been one of the most professional and friendly that we’ve communicated with on this tour. In the afternoon, we proceed toward New Orleans, Louisiana… for a few days of fun and work. I’m really excited to be in New Orleans– never been there. Finally, make sure you take an opportunity today to discuss the American Election process with your children. 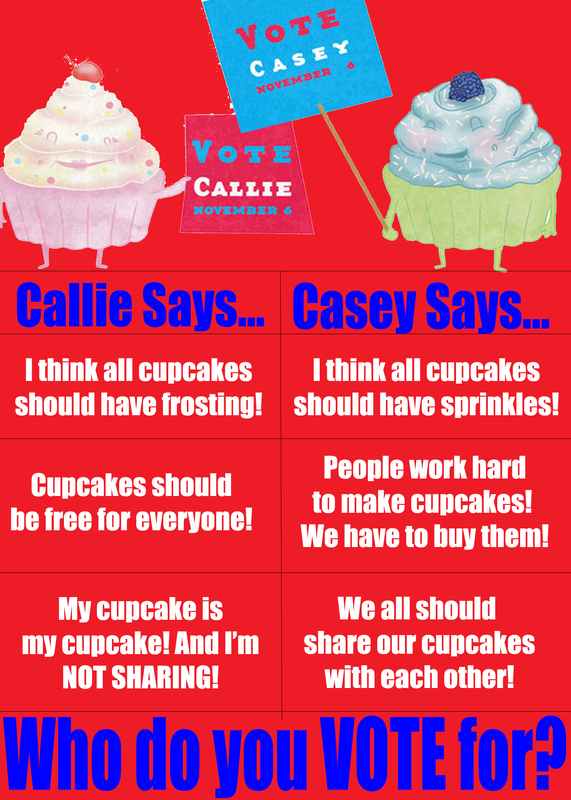 To make this easier for you, we’ve created a mock election using characters from our new Children’s Book, Casey and Callie Cupcake. Please have a look at www.PeteThePopcorn.com Voting is free and fun! Talk to you soon… and happy voting— both for Presidents and Cupcakes. Discussing American Elections… With Your Kids! I don’t have kids. But I write Children’s Books. And… get this… I was a kid once! To my benefit, I had a great, educated and involved childhood. My parents watched the news. They voted. Yes, they even took me into the ballot box with them. I remember in 1996 when President Bill Clinton was running for re-election, they took me to a giant rally in downtown Toledo, Ohio as Clinton was making his way across the country to the Democratic National Convention. The thrill of seeing the President of the United States speaking right there in front of me was something so very cool… and I wouldn’t be old enough to vote until Election 2000. In 2000, I made a point of doing it again: I went to see Bill Clinton “handing the torch” to Al Gore in a massive rally in Monroe, Michigan. Hillary and Tipper were there… news cameras all around. Unfortunately, the temperatures were sweltering and senior citizens were passing out… but that’s what always happens with Bill Clinton. The man doesn’t know how to read time, apparently. In 2002, I met Rudy Giuliani on his National Book Tour for bestselling autobiography Leadership. In 2003, I went to a book signing for Senator Hillary Clinton for her autobiography, Living History. In 2004, during the Democratic primaries, I traveled to Iowa to work for one of the candidates running for the nomination. Seeing the process of the caucuses was so interesting… the most on-hand educational thing I’ve ever done when it comes to politics. Also in 2004, thanks to living on the border of two swing states, I got to see the effect of celebrity on Presidential politics, as well. I went to events that featured James Taylor, The Dixie Chicks, Roseanne Barr, Gloria Steinem and Michael Moore. In 2008, I went to several events for Senator Hillary Clinton during the Democratic Primaries. And I met Chelsea Clinton on an airplane while I was working. Living in Hawaii during the 2008 general election, I missed out on all candidate visits or rallies. After all, Hawaii isn’t a swing state. In 2009, I was visiting my parents in Toledo when I learned that Sarah Palin was appearing in Ft. Wayne, Indiana for a book signing. What a fascinating political figure Ms. Palin is… so I knew I had to go. As you can see, due to my upbringing, I’ve always had an immense interest in politics and elections. Election night is like the Super Bowl times 1000 for me. I like to watch the returns and look at individual counties and Senate races in an attempt to read the tea leaves for National implications. And I do also make predictions… though I’m keeping those to myself this year. In 2012, it was my goal to see both candidates live and in-person. I saw Mitt Romney this past summer in Bowling Green, Ohio. It’s always a different ballgame when you see a candidate through your own eyes, with no opinion or media input distracting your gaze. At any rate, through this year, I will have voted for 2 Democrats running for President. And 2 Republicans running for President. As for local and statewide races, if I went back to 2000 when I was 18 and added everything up, I’m betting that my ticket would be split– about 52% D and 48% R. I vote for the person— not the party. I know what I believe in. So I look for the person that best represents my view. It’s my goal to teach children about the election and politics like my parents taught me. Before the 2016 election, I hope to have a unique and informative iBook available that will help parents talk with their kids about politics, elections, political parties, political figures currently on the scene and historically— and much more. Until then, I wanted to devise away to get the conversation started this year. 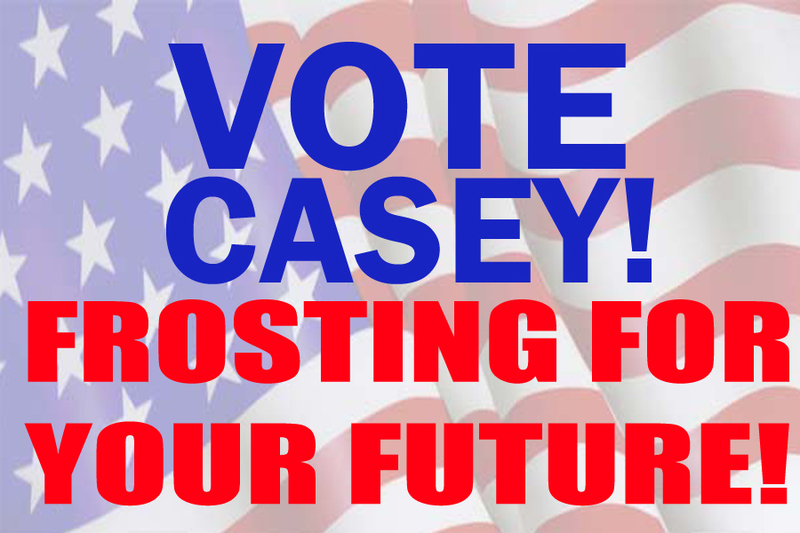 So we decided to do a “soft launch” of our new book Casey and Callie Cupcake on Election Day! By a “soft launch” I mean that the book is now available for pre-order… and will be shipping before the end of the year. What are the advantages to pre-ordering? For every pre-order we receive, we will donate a book to a school library in your name. On Tuesday, children, parents and teachers can go to www.PeteThePopcorn.com to VOTE for either Casey or Callie Cupcake. 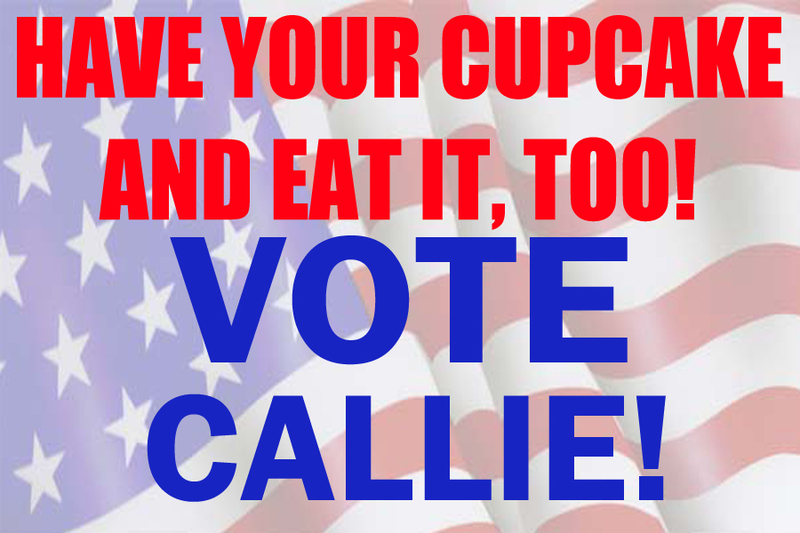 Casey and Callie both have their own campaigns going on— one believes in free cupcakes for all. The other says that people have to work hard to make cupcakes, so they should sell them. One says every cupcake should have sprinkles. The other says frosting is the way to go. As you can see, we’ve made the “issues” sound like things that children will understand, but which will also make adults think. Sure, we know that issues become more complicated when we are talking about serious issues like taxes and health care. But, as humans, we understand more about ourselves when we are attempting to explain something to another person. Also, maybe those issues don’t line up like what one would expect. We have to learn that, when we are looking at candidates for office, this isn’t a damn Frankenstein experiment. You can’t take a piece of “pro-gay marriage” and a piece of “anti-tax” and a piece of “conservative on health care” and a piece of “pro-choice” and a piece of “pro-military-spending” and a piece of “pro-union” and a piece of……….. whatever………. and then stick all of those pieces into one candidate to produce one perfect candidate for office. We have to learn that there is no chance of coming up with the perfect candidate. But we need to look at the issues that affect us in this order: 1) What affects the country? 2) What affects my Children? 3) What affects me? So, when you’re looking at Casey and Callie and their positions, if they are at odds with what you feel in your mind… remember that there are no perfect candidates. We choose the ones that most represent our beliefs. During election years, we all (especially those of us in swing states) get tired of advertisements. We get jaded by negativity. Watching Congress in action, we shake our heads because things just don’t get done because of partisan divides. But how do we change all of this? By raising children that understand how important our right to vote is. Our next generation needs to know that choosing candidates based on issues instead of parties is OK. The children that will be voting in 2016, 2020 and 2024 should learn that, no matter how tired we adults become with the process, that this process is so unique in the world today– and it’s what makes us Americans. Tell your friends that are parents— take your kids to www.PeteThePopcorn.com before 8:00 PM on Tuesday to vote for Casey or Callie Cupcake. Have a conversation with them about elections and voting. It will feel good and it will get you thinking, too.